“Hosanna!” the people shouted. 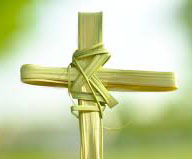 “Blessed is he who comes in the name of God!” they proclaimed, as they laid palm branches before him. Yet, did they know they were mere extras in a dramatic production? Did they know Jesus was acting out a carefully staged drama? Little did they know…. Join us this Palm Sunday as we explore what Jesus was up to even as we, with great joy, welcome Jesus, the Messiah. Hosanna, indeed.